and see your name inscribed on one of our new theater seats! Though Studio5’s doors are open and we now have a beautiful, functioning facility, we are undergoing a capital campaign to help fund the completion of the many physical components necessary to allow us offer a rich, intimate state of the art performing space to students as well as professional performing artists. These items include our retractable seating system, moveable wall, theatrical lighting, curtains, acoustical treatments and broadcast quality audio/video equipment, all of which combine to allow us to transform the space from classroom to theater in less than an hour. 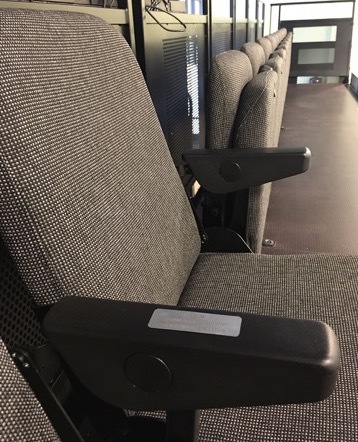 When you "sponsor a seat", you will be a partner in this beautiful new space, and we will show our deep appreciation for your $1,000 gift by creating a dedication plaque with your name (or that of a loved one, or group, if you prefer) and installing it permanently on the armrest of one of the 104 new theater seats. Donations are not tax-deductible, however, naming rights – and the knowledge that you have supported the performing arts in our community – last for a lifetime. Many thanks to our VIPs who have already sponsored a seat!